Beginning with portraying pedophiles as victims of our closed-minded society, Democrats are pushing to legalize pedophilia along with 11 other perversions. https://nws.mx/2Au67DA Civil unions granted homosexuals the same benefits as marriage. And yet, Democrats chose to use activist judges to destroy God’s sacred union of marriage. This is a long way down the road from LGBTQ activists claiming they simply wanted tolerance. Today, many Americans quake in fear opposing any demand of LGBTQ activists. Democrats want the government to mandate that Christians throw away their Bibles to fully embrace Democrats’ anything-goes-sexually society. Democrats use blacks, women, homosexuals, and Muslims as useful idiots to further their extreme radical leftist agenda. For example. Democrats and fake news said that opposing Obama’s punish-America policies were racist. Had Hillary won, opposing her leftist agenda would be branded sexist? If homosexual Democrat presidential candidate Mayor Pete wins the WH, opposing his extreme radical leftist ideas will be branded homophobia. If one of the antisemitic Democrats wins the presidency, opposing their hate-Israel rants will be branded Islamophobic. This tactic is called “Shaming”. Democrats and fake news routinely use shaming to silence all opposition, while forcing their anti-American and anti-Christian agendas down our throats. Respecting Islam, a California public school caved to Sharia Law by forbidding students to draw images of Mohammed. https://bit.ly/2VmJPOO And yet, Democrats defended the NEA funding “Piss Christ” which featured a crucifix submerged in urine. 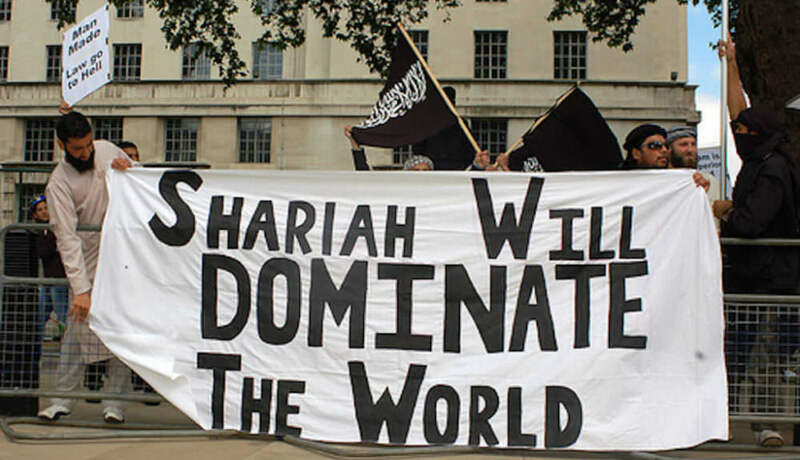 Thank God Texas turned back the establishment of the first official Sharia court in America. https://bit.ly/2UdSUgl Do not become complacent folks. These people will never give up and will keep coming back at us. Traditions, principles, and values everyday Americans and Christians hold dear are under relentless attack by Democrat enemies-within. As a Christian, I view Democrats’ aggression as the Spirit of Anti-Christ. Jesus proclaiming himself our Savior and Lord is as repulsive to leftists as is showing Dracula the cross. This is why even though Islam clearly hates homosexuals and suppresses women, Democrats overwhelmingly prefer Islam over Christianity. Democrats are banning Christianity in public school while quietly replacing it with Islam.